The Ryer House was built in 1873 by David G. Ryer, a prosperous New York produce merchant. 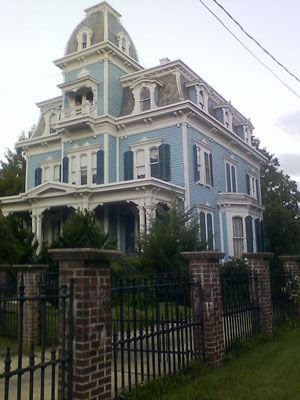 It is a fine example of the Second Empire style, featuring characteristic details such as a Mansard roof, a central tower, an elaborate front porch, ornate molded cornices, and bay windows. The Ryer House remained a private residence until roughly ten years ago. The current owner bought the house in 2007 intending to convert it to offices. He has been unable to get the requisite zoning variance for the vacant and declining building. Consequently, he has announced his intention to demolish the building. Although he continues to pay the property taxes, the Ryer house is sitting in limbo, slowly being demolished by neglect. Many of the home’s interior features, including chandeliers and Tiffany doors, have gone missing. Pipes have burst, causing interior finishes to deteriorate. Windows are broken and boarded up. Preservation New Jersey encourages the Borough of Matawan and the current owner to renew a dialogue. There are many examples of successful conversions from historic residence to office space or other compatible uses. PNJ hopes the local opposition to rezoning can be reconsidered, or other uses for the property investigated. Something can and should be done before Matawan loses an important local landmark and architectural gem.